Think brave thoughts and go for it. Somewhere between underwater somersault #236 and #237 they'll want to come dry off. Sandestin was made for evening strolls. Be sure to check out dinner menus along the way. Picture your family here - maybe with a few toys on the floor to make it feel more like home. Your kids will have a blast at the children's club, children's pool and the arcade. With a golf course onsite, and both The Links Golf Club and Baytowne Golf Club nearby, you have plenty of options. 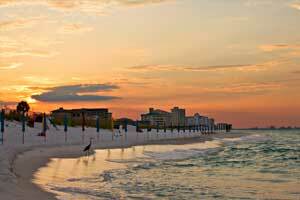 Sandestin Village is located within the SanDestin Golf & Beach Resort in the heart of Miramar Beach in Destin. Don’t bother unpacking once you get to your condo. Just dig through your luggage for the essentials: swimsuit, sunscreen and water wings. The lagoon style pool and hot tubs await your mad cannonball skills. Challenge the kids to see who can make the biggest splash. Order a drink from the poolside bar and grab a lounge chair. You might as well get comfortable; you could be here for hours (not that it’s a bad thing). Once you’ve had your fill of the pool, drop the kids off at the children’s club and gather all of the golfers in your party. Guests of Sandestin Village receive access to four golf courses designed by Tom Jackson, Robert Trent Jones Jr. and Rees Jones. Rent a golf cart and try all four. Individually decorated one- to two-bedroom condos sleep two to four guests and are located either in the Village or Grand Complex of the SanDestin Golf & Beach Resort. Full Kitchens allow you the freedom to make and serve meals in your condo. Not up for cooking? No problem! You have nineteen restaurants at your disposal that serve everything from fish tacos to ice cream. There’s even a 50’s-style Diner and a nightclub! After returning from dinner, enjoy a low-key night in. Have everyone change into their PJs, grab a selection of snacks and call the family into the living room. First kid on the couch is in charge of the remote. While they are deciding what to watch first, put your multitasking skills to good use and throw a load of laundry into the in-suite washer/dryer. Join everyone else on the couch and get ready for a fun night with the family. Sandestin Village is just a short drive to the Baytowne Marina. This full-service 98-slip marina can accommodate up to one-hundred and forty yachts. Rent a sailboat or take advantage of the available deep-sea and bay fishing charters. Did you know that Sandestin Tennis Center was voted one of the top twenty-five Tennis Resorts by Tennis Resorts Online? It is also home to the #1 Rated Tennis Pro Shop. There are twelve world-class HydroGrid clay and three hard tennis courts. Whether you want private lessons, need to rent equipment or need help finding a partner, Sandestin Tennis Center has everything you need to get your Serena Williams on. Village of Baytowne Wharf offers unique shops. Aloha Surf Company features name brand beach and surf wear, sunglasses and accessories for kids and grownups. Barefoot Princess features apparel, jewelry and footwear. Little ones will love the cute apparel and toys at Coconut Kidz. Sandestin Clothing Company is Sandestin’s signature logo shop featuring apparel and souvenirs. - Check-in for this property is based at the Sandestin Welcome Center located at 9300 Emerald Coast Parkway, Miramar Beach, FL 32550. For more details, please contact the office using the information on the reservation confirmation received after booking.